« Marijuana in Alabama: Show me the money! The “Blame Game” is a popular political football not only in our nation’s capitol, but across the nation in statehouses. The “polarization” oft described by news outlets and “fake news” is a direct result of practices used by Republicans, which began in large part with Newt Gingrich. You know, the Newt Gingrich who was the Georgia Republican having an extra-marital affair while trying to impeach then-President Clinton for a sexual tryst with White House Intern, Monica Lewinsky. Yes, the same Newt Gingrich who divorced his first wife (Jacqueline “Jackie” May Battley, who was his high school geometry teacher) while she lay in hospital recovering from cancer surgery while he was campaigning in hopes of becoming the GOP’s presidential nominee. That’d be the same Newt Gingrich who next married a Congressional aide (28-year old Marianne Ginther) with whom he was philandering while married to his first wife Jackie, and asked her to marry him before having divorced his first wife, and then married Marianne a mere six months after divorcing Jackie, who also asked her (Marianne) if she would be interested in having an “open marriage” in which he could have a mistress and a wife. Now, the Bully in Chief is blaming Democrats because he can’t get his way – which is BILLIONS MORE for a “concrete, rebar-reinforced wall,” which has since devolved into “steel slats,” or even less, a simple “barrier.” Notice how things are changing already? 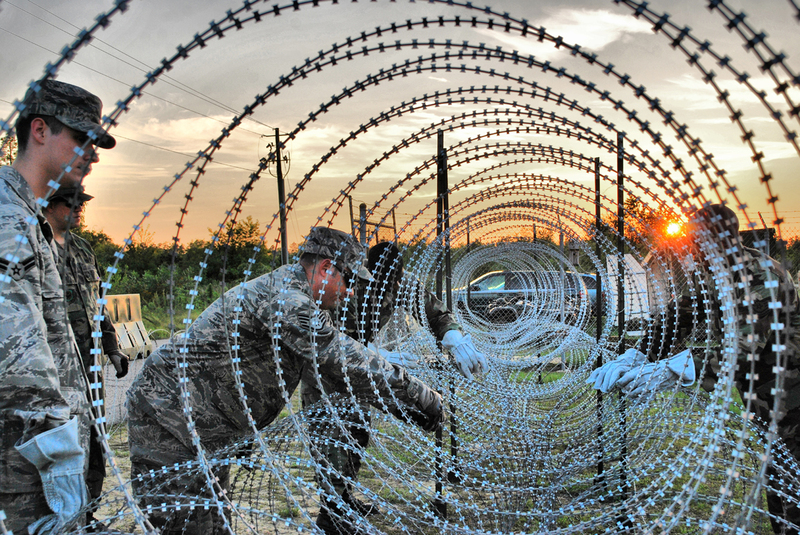 Next thing you know, it’ll be a row of concertina wire spooled across the 1954 miles of U.S./Mexico border. Frankly, it’d probably be much cheaper, not only in the immediate term, but in the long term, as well. You see, one of the things that NO ONE – not even the Congressional Budget Office, nor the Government Accountability Office – has studied is “how much the upkeep of ‘the wall’ will cost American taxpayers. Say anything to get elected, or if you prefer, to get into Lady Liberty’s & America’s pants. The net effect is the same. Look, I’m no fan of either Gingrich or Trump as human beings, and I think that Trump is vastly out of his league in any government, much less at the Federal level, and as President. He’s told more brazen lies than almost anyone can remember, and has sown confusion in our nation, which is not only demoralizing domestically, but makes us look like buffoons in the eyes of our international allies, and enemies. But, to give credit where credit is due, I think his outrageous abuses have done more to strengthen domestic government than almost any administration in the past 50 years, insofar as his abuses, while technically legal, are pointing out areas that need strengthening. And I do NOT mean to refer to “the wall.” I mean to refer to his myriad promises to show his tax returns (which he claims he will once the audit is complete – it’s been over two years now), and more. So, that’s one good thing that he’s supported. And, he should be acknowledged for it. Other than that, there’s not much else that’s good that I can think of. There’s no border wall with Canada. Why not? “Mr. Gorbachev, TEAR DOWN THIS WALL!“ His remarks were made Friday, June 12, 1987, at the Brandenburg Gate, in West Berlin. Police states put up walls to keep their prisoners in. Walls, gates, fences, etc., are barriers, just like moats around Medieval castles, with their drawbridges. Remember: Here be dragons. They were just about as effective. Not very. But, back to the idea of government shutdowns. The whole idea behind it was, as you might’ve guessed, a dig into history. A law known as the Antideficiency Act, was passed during President Ulysses S. Grant’s term, was “rediscovered” by attorneys in congress and Justice Department in the spring of 1980 (Reagan’s term), and cited by his administration when it ordered much of the federal government to come to a halt. 1.) Reagan: May 1, 1980, the Federal Trade Commission (FTC) was shut down for one day after Congress failed to pass an appropriations bill for the agency. Lawmakers were deeply divided on the question of the FTC’s mandate (TRANSLATION: Republicans), and failed to pass a new authorization bill for the agency before the old one expired. So on that day, all the FTC’s 1,600 employees could do was cancel court dates, depositions and meetings, and pack up files as if they were shutting down. In fact, most of May 2 was spent rescheduling these meetings and court dates and unpacking the files. And according to a GAO study about the shutdown which was published March 3, 1981, the total cost of the shutdown which Republicans saddled on taxpayers, was $700,000. 2.) Reagan: November 23, 1981: 241,000 federal employees were furloughed for one day because President Reagan vetoed a spending bill that contained a smaller spending cuts than he wanted. The shutdown was cost taxpayers $80–90 million in back pay and other expenses. 3.) Reagan: October 4, 1984: 500,000 federal employees were furloughed for one afternoon over an inclusion of a water projects package and a civil rights measure that President Reagan opposed. Congress removed those programs, and included a funding compromise for the Nicaraguan Contras. Total cost to taxpayers: Back pay $65 million. 4.) Reagan: October 17, 1986: 500,000 federal employees were furloughed for one afternoon over several issues. Cost to taxpayers: $62 million in lost work. 5.) George H.W. Bush: October 6-8, 1990: Over the Columbus Day weekend, because of a deficit reduction package negotiated by President George H. W. Bush which contained tax increases, despite his campaign promise of “Read my lips: No new taxes,” which was led by then-House Minority Whip Newt Gingrich who defeated the initial appropriations package. A total of 2,800 workers were furloughed. Total taxpayer cost: $2.57 million in lost revenue and back wages. 6.) Clinton: November 14–19, 1995: Government employees were furloughed and non-essential services suspended during disagreement between Democratic President Bill Clinton and the Republican Congress over funding for Medicare, education, the environment, and public health in the 1996 federal budget. Total cost: 800,000 employees furloughed. 7.) Clinton: December 16, 1995–January 6, 1996: Government workers were furloughed and non-essential services suspended over President Clinton’s disagreement with Speaker of the U.S. House of Representatives Newt Gingrich on the spending bill sent to him by the Republican controlled Congress. Total cost: 284,000 employees furloughed. 8.) Obama: October 1–16, 2013: Cost: 800,000 employees furloughed, 1.3 million were required to report to work without knowing when they’d get paid. The Republican-led House of Representatives was encouraged by Republicans including Texas Senator Ted Cruz, Sarah Palin, and right-wing extremist groups like the Heritage Foundation over budget sequesters to fund the Patient Protection and Affordable Care Act (PPACA). It ended when Congress passed the Continuing Appropriations Act, 2014 suspending the debt limit, and the President signed it. Total Cost: $2.0 billion in lost productivity of 850,000 furloughed employees daily. Council of Economic Advisers estimated that 120,000 fewer private sector jobs were created during the first two weeks of October. 9.) Trump: January 20-23, 2018: Republicans refused to include DACA funding. The Republican-led House wanted four weeks “stopgap” funding, Kentucky Republican Senate Majority Leader Mitch McConnell proposed three. The president signed it. 10.) Trump: February 9, 2018: No employees furloughed nor government services disrupted because the funding gap occurred overnight and was resolved near the beginning of the next workday. 11.) Trump: December 22, 2018–ongoing: Trump is being pushed around by Ann Coulter and Rush Limbaugh over $5.7 billion funding for a border wall that was a core Trump campaign promise. Cost: 380,000 employees placed on unpaid furlough, 420,000 essential personnel required to work without pay, many are taking a “sick out,” endangering public safety and services. Because the shutdown was triggered by the failure to enact spending bills that continued a federal government pay freeze, hundreds of senior Trump administration political appointees would receive a roughly $10,000 pay raise in two days. Vice President Pence’s salary would see a $12,800 increase. Acting Director of the Office of Personnel Management Margaret Weichert, ordered department and agency heads to suspend the raises. For more detail, see a Congressional Research Service report entitled “Shutdown of the Federal Government: Causes, Processes, and Effects” updated December 10, 2018. This entry was posted on Monday, January 7, 2019 at 4:47 PM	and is filed under - Business... None of yours, - Did they REALLY say that?, - Lost In Space: TOTALLY Discombobulated, - Politics... that "dirty" little "game" that first begins in the home.. Tagged: budget, Dragons, GOP, Liar in Chief, lies, Mexico, money, Newt Gingrich, Pence, POS45, Republicans, The Wall, Trump. You can follow any responses to this entry through the RSS 2.0 feed. You can leave a response, or trackback from your own site.